Firewood is environmentally friendly because using it results in virtually no ‘fossil’ carbon dioxide being added our environment and limits the effects of climate change when compared to using gas, oil or coal. Firewood supply can create local, rural jobs and revenues and can play an important role in reversing rural economic decline by promoting locally sourced environmentally friendly fuels and recycling. Because trees contain a lot of water, freshly cut logs can contain around 50% water which are difficult to burn without some drying or seasoning taking place. 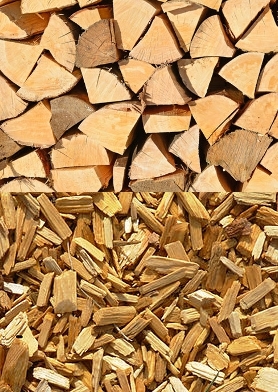 Wood felled during one winter should be seasoned over the next summer intended for burning during the following winter, they then hold approximately 33% moisture. For best results two years seasoning is recommended to further reduce moisture content to 25%. Different trees naturally hold less water than others. For instance freshly felled ash tree contains only a 33% moisture content while a fresh poplar tree has a higher moisture content in the region of 66%. Certain types of trees make for better firewood than others. Broad leaved trees are denser than softwoods such as pines and provide more heat per load. The heavier and therefore the denser the wood a higher calorific value is provided and as a result it burns for longer. Ash, Beech, Sycamore, Hawthorn, Crab Apple , Oak, , Birch, are an excellent class of firewoods although some very dense woods such as as Oak and Beech can be harder to burn and are advised to be burned alongside other wood types. Wood chippings have a multitude of uses, they can be used in the garden and are excellent used as mulch to provide a great natural barrier against frost, insects and the elements which help to retain moisture and nutrients levels to the roots of the plants, helping to feed and retain water supply to your vegetable patch, flower baskets or beds. Woodchips are an environmentally friendly alternative to gravel providing an instant cost effective ground covering to provide attractive decoration to garden areas and surfaces they are excellent for use in poultry runs which help keep poultry occupied for hours while they foraging for food. They can help to keep chicken areas clean and allows for natural breaking down of ground waste. Woodchips also provide a safe ground cover for children’s play areas where kids can let loose their energies without fear of hurting themselves. Spreading roughly 4-5 inches of wood chipping onto the ground near any play equipment, will act as a good method of helping stop too many bumps and bangs.